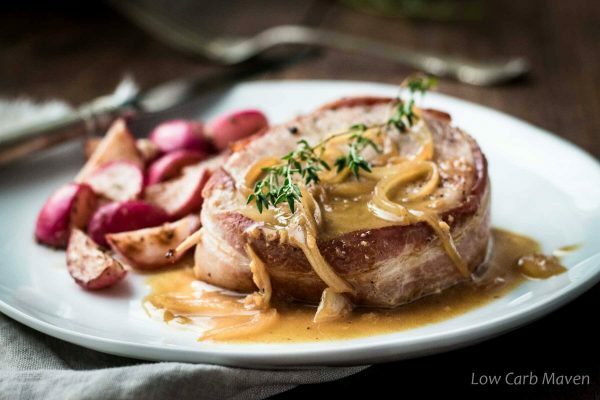 Pan seared bacon wrapped pork chops with a delicious apple cider vinegar glaze (the perfect pan sauce) flavored with onions and fresh thyme. Another great entree ready in under 30 minutes. If you’re a regular on LCM you know I use my skillet for most of my savory dishes. Why? Because it gives a good sear/color to meat, and leaves a nice brown fond (caramelized meat juices) on the bottom of the pan. This makes for building the BEST pan sauces with little to no-effort. And, a good pan sauce elevates a good meal to GREAT in less than 10 minutes! 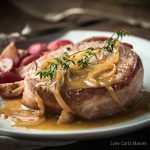 Before I get to this tasty and oh-so-easy recipe for bacon wrapped pork chops, let me first tempt you with some other recipes that are cooked in a skillet and served with a lick-your-plate-clean sauce. 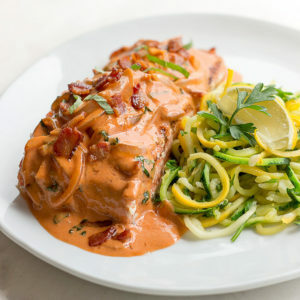 Make sure to check out the recipes for Chicken Poblano and Salmon with Bacon Tomato Vodka Cream Sauce. They. Are. So. Good! That’s a pretty fancy name for such a simple dish. Many of my entrees feature cream. This one doesn’t and can be made Paleo or dairy-free just by subbing olive oil for the butter at the end. The star of the recipe is plain old apple cider vinegar – I like Braggs, but use what you have. Vinegar makes a terrific pan sauce. Reducing the vinegar concentrates and mellows the flavor producing a little acidic bite with a touch of sweetness. You can increase the sweetness in the sauce by using maple bacon or adding a little sweetener. I did. But it doesn’t need much, so taste and adjust the final seasoning at the end. WARNING: Make sure not to stand right over the pan while the sauce reduces, because the steam is quite pungent. You don’t want to burn your nose! I love cooking and eating pork and often buy a large pork roast from Costco to portion into chops, stew meat and shish kebab meat. I have an older post that talks about how to cut up a whole pork loin. It’s useful information. Three thick boneless pork chops were the perfect amount for my family of 4, when served with 2 sides. For 4 adults you might want 4 pork chops. If you are low carb and following a keto diet, you will want to watch your portion size since pork is a rich source of protein. The usual serving is 3 ounces of cooked meat for women and 4 ounces for men, but this may vary depending on age, activity level and individual macros (if you track them). TIP: You don’t have to use pork in this recipe. 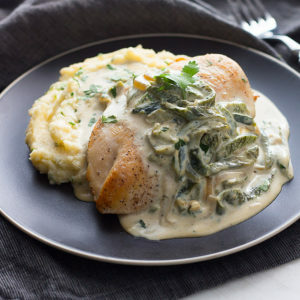 In fact, you can sub a boneless skinless chicken breast for almost any boneless pork chop recipe. I even sub chicken for some fish recipes. Of course cooking times will vary depending on what you are subbing for, but it works great! 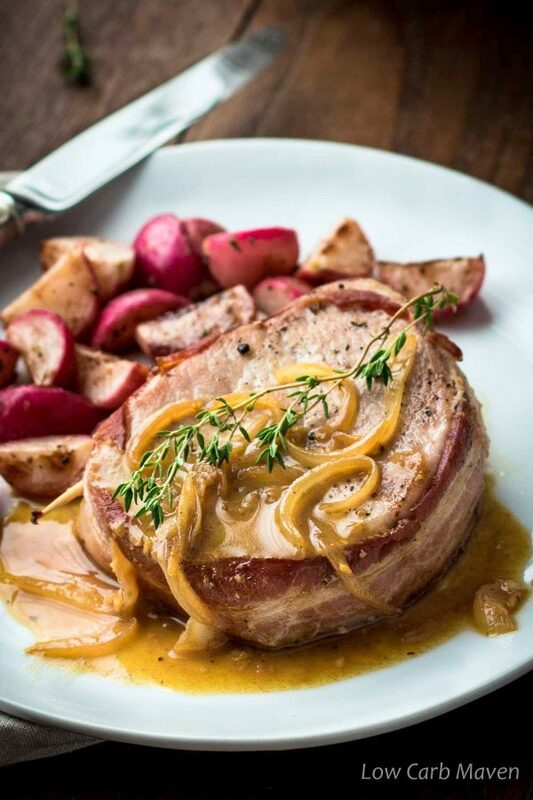 Bacon Wrapped Pork Chops With Apple Cider Vinegar Glaze is 1.5 net carbs per serving. Pan seared bacon wrapped pork chops with a delicious apple cider vinegar glaze (the perfect pan sauce) flavored with onions and fresh thyme. Ready in under 30 minutes. Trim the fat off of the pork chops and wrap a piece of bacon around each one, securing it with a toothpick. Rub a total of 1 1/2 teaspoons of oil over both sides of the pork chops and season both sides with salt and pepper. Finely dice the onions and mince the garlic. Heat a pan over medium heat until hot but NOT smoking-hot. Add the remaining oil and swirl to coat the bottom of the pan. Add the pork chops on edge to brown the bacon, placing them right next to each other to keep them upright. Cook for 1 minute per side. This takes a little fiddling, but is worth the effort. Place the pork chops into the pan to cook the top and bottom surfaces, 3-5 minutes per side depending on the thickness. Remove the pork to a plate and cover loosely with foil. Add the onions and garlic to the pan and saute for 1-2 minutes or until they begin to turn translucent. If the pan is dry, add a little of the water to help them soften. Add the chicken base and thyme to the pan and stir. Add the water and then the vinegar to the pan and stir, scraping up any browned bits stuck on the bottom of the pan. Reduce the sauce by half and add any accumulated juice from the pork back to the pan. Remove the thyme. Add the butter and stir until it has been incorporated into the sauce. Simmer and stir the sauce until it appears glossy. Adjust seasoning by adding sweetener if you would like, additional salt, and pepper. Spoon the sauce over the pork before serving. It's not a lot of sauce, but is full of flavor with a nice acidity and mild sweetness. Serves 4. *Let the pork chops come to temperature for 20 minutes before cooking. Putting cold meat in a hot pan will shock the meat making it tough and dry on the outside and raw in the center. The sauce was very good. I’ll be making this again. I used 2 tsp regular sugar to sweeten it and about 1/2 tsp of dried thyme. Did not wrap pork with bacon since our chops were very thin and didn’t want them to overlook while cooking bacon. Thanks for the cooking tip on the chops. We’ve about given up on pork chops as they have been very tough and dry lately. We will try this method on our next attempt. Made this for dinner last night! It was wonderful! I will be adding this to my list of rotation dinners! Thanks for the great meal! All I can say is wow! 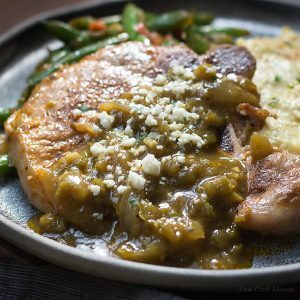 Made this for dinner and both my partner and I were swooning over how incredible these pork chops are! Totally gourmet restaurant quality. I’m so happy we have two chops left over for tomorrow night’s dinner! This recipe is deceptively simple, tastes like something from a fine dining restaurant. I was a little nervous about the vinegar, but this was really a standout dish. My husband really loved it and so did I. We had it with asparagus and a side salad. It was perfect. Thank you. This looks amazing. You definitely have the best low carb recipes of anyone. Thanks for sharing. Hey Kim, your dish is looking very delicious, i love to taste it.